It's been a hit from day one and there are more ZZ4's on the road than any other Boss Hoss style. The powerful drive train includes the stone cold reliability of the 350 cubic inch GM performance engine coupled to our proprietary two speed semi-automatic transmission with a true reverse (standard on all our bike models.) All Boss Hoss Motorcycles are fed by electronic fuel injection and electronic instrumentation provide the dash cluster with enhanced rider feedback. The Boss Hoss LS3 takes our standard BHC-3 platform to a new level of handling and performance with the all-aluminum 6.3 liter Corvette power plant. The hottest new small-block with its multi-port fuel injection system produces 445 horsepower and 445 foot-pounds torque. 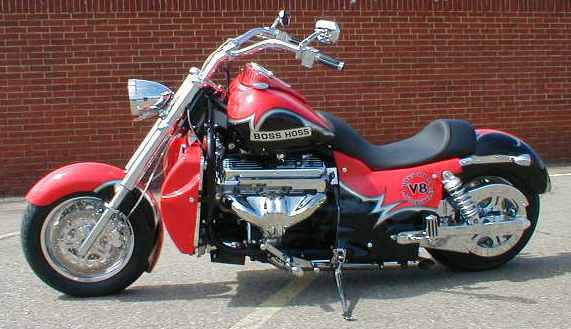 Couple this with the weight shed by this all-aluminum engine and you get the strongest horsepower to weight ratio ever produced by a Boss Hoss Motorcycle. The torque of a big block... the agility of a sport bike... truly makes the LS3 the ultimate production motorcycle. The 3 inch lower seat height and a 3 inch shorter wheelbase of the Boss Hoss Super Sport have expanded the appeal of a V8 powered motorcycle to a broader range of riders. Powered by your choice of the fuel injected ZZ4 350 (5.7L) engine that has been the cornerstone of the Boss Hoss world... or the new all-aluminum LS3 (6.2L) monster small-block. 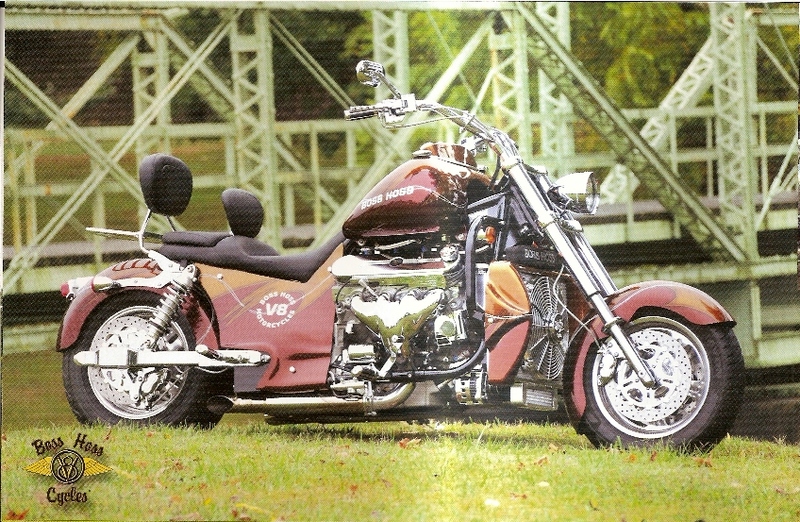 The ingenuity of this motorcycle design allows the Super Sport rider to sit in the bike, not just on it !! Overall Length 106" 106" 103" 103"
Wheel Base 80" 80" 77" 77"
Seat Height 28" 28" 25" 25"
Ground Clearance 4.5" 4.5" 4.5" 4.5"
Frame/Body Width 28" 28" 28" 28"
Front 130/90-16, 3.50"x16" 130/90-16, 3.50"x16" 130/90-16, 3.50"x16" 130/90-16, 3.50"x16"
Rear 230/60, 7"x15" 230/60, 7"x15" 230/60, 7"x15" 230/60, 7"x15"